Ukrainian Prime Minister Mykola Azarov has ordered Ecology and Natural Resources Minister Eduard Stavytsky to develop a new strategy for environmental protection. The premier issued the instruction on Thursday when opening a meeting of the government. "I think it's time to fundamentally settle the issue of legislation in the field of environmental protection, tightening controls and responsibility. The Ecology and Natural Resources Ministry needs to radically change its activities, take a principled stand and offer to the government a new strategy for public policy in this area," the prime minister said. 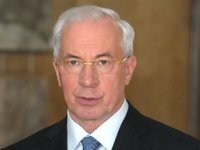 Azarov also said the Environment Day is observed in Ukraine on May 5. That day the premier plans to visit the Environment Ministry to inspect its work. "On Saturday, May 5, I plan to visit the Environment Ministry to inspect its work and to hold a conference call with the heads of regional administrations," Azarov said. As reported, on April 20, Ukrainian President Viktor Yanukovych dismissed Mykola Zlochevsky from the post of the ecology and natural resources minister and appointed head of the State Service for Geology and Mineral Resources Stavytsky to this post.